I love Chex Mix about as much as I love Rice Krispy Treats. When I first came across the recipe for Barbecue Chex Mix, I knew my son, Aaron, & I were going to love it. As I frequently do, I adjusted the recipe a bit. 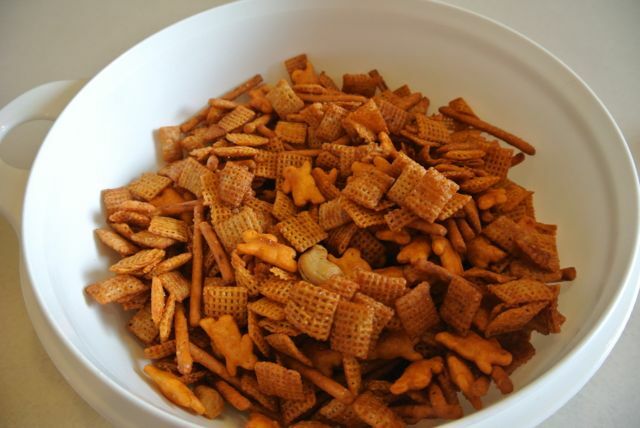 First, I like almonds or mixed nuts rather than peanuts in any flavor of Chex Mix. Second, I need salt! On this recipe, I found that adding a minute in the microwave helped it dry better, otherwise it is a bit too chewy. Combine cereal, crackers, pretzels, & nuts together in a large microwave safe bowl. Stir together barbecue, honey, oil, garlic, & onion powder. Pour over cereal mix. Using a large spoon, toss to coat evenly. Microwave for 8 minutes, stirring every 2 minutes. Spread on waxed paper. Sprinkle with salt. Allow to cool & dry completely before storing.